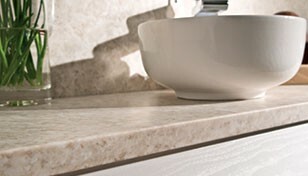 minerva worktops are available in a range of stunning decors to complement any bathroom design. The subtle veining of Black Storm brings a unique interest to your bathroom surface. Hints of white and red are diffused into the smoky grey-black background. 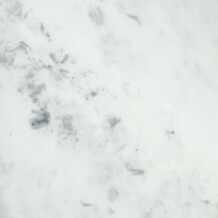 The marble veined effect of Carrara White has a unique charm that works as well in contemporary bathrooms. Reflecting the natural appeal of mable, each sheet is unique so you can be sure your bathroom is unique too. 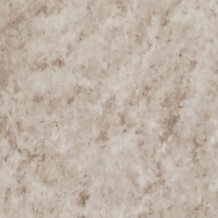 Creams and whites swirl in this fascinating, subtle décor. Perfect to offset crisp white pottery or to co-ordinate with gloss white doors or dark wood furniture tones.  White has become a strong trend for solid surfaces – team with matching doors for a simple, calm style, or with splashes to make a statement.